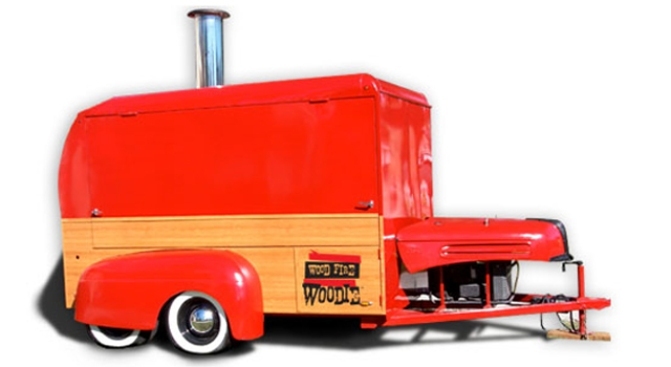 The Wood Fire Woodie's trailer on display. Hungry Caltrain riders have a new friend. A pizza vendor will open shop at the Hillsdale Caltrain station in San Mateo Friday, an agency spokeswoman announced. Wood Fire Woodie will be open from 4 p.m. to 8 p.m. and is inviting Caltrain customers to stop by on their way home to taste-test a sampling of the pizza, spokeswoman Christine Dunn said. During weekday commute hours, the vender will serve coffee, espresso, baked goods, lunch items and take-and-bake pizzas. On Monday and Wednesday evenings, Wood Fire Woodie will serve made-to-order pizzas. For more information, visit Wood Fire Woodie's Web site.